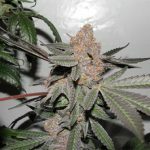 Grand Daddy AK-47 medical marijuana is arguable one of the more pungent, thick smelling, sweet and spicy tasting strains whose buds are adorned with a thick layer of crystallized resin. With a hot green and yellowish hue all throughout them, every nugget shaped bud looks almost the same as the other. Covered in eye watering orange-brown pistils, this strain has a flavor that will dance madly across your taste buds on their way to your head. It is a multi-trophy holding Sativa strain that earned its name, “The One Hit Wonder” from how quickly (0 to 60) and completely (in no time flat) it becomes an expansive body experience from head to toe… and back again! Bright and sparkling in appearance, full bodied in effect, the physical sensation starts in the head rapidly moving to the legs then feet, filling them with a new found, pain-free energy. At the same time, your head and body are up for an E-ticket ride. Lock N’ Loaded for bear, this one is really a top shelf strain that lives up to its reputation. Our AK-47 superior medicinal properties include, help with minor back pain-also good for Cramps. 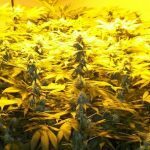 It is an instant mood enhancer and motivator and will help patients greatly with almost any disorder that they may have except for very serious pain. 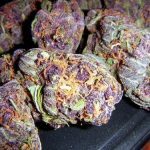 Our strains are ranked and rated as a true medical marijuana strain. This entry was posted in Grand daddy purp and tagged ak-47, GDP, Grand Daddy Purp. Bookmark the permalink.